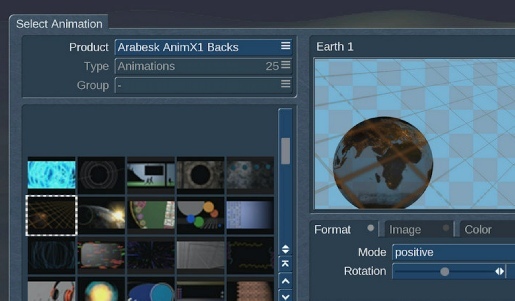 New Arabesk AnimX comes with a large collection of animated objects for use in Arabesk but can also be used with other other programs via the AnimPool. The elements can be selected in Arabesk as a background, moving background, moving overlay or animated buttons. With the included effect itself, any two animations from the Bogart AnimPool can be used too so nothing stands in the way of combining it with other popular "AnimX" effect packages. You can download the 548Mb file for the software and write it to disc as an .ISO file using the above link or order it from us, £3. You can run this software in DEMO mode so that you can check out the features prior to purchase.